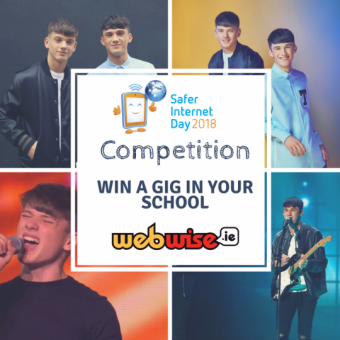 Today, across Ireland over 100,000 people in schools, youth groups and clubs joined together in celebrating the fifteenth year of Safer Internet Day. We were not alone, over 130 countries around the world also marked Safer Internet Day. Participation in Ireland reached its highest yet, with students drawing, dancing and even did cartwheels! The lead up to Safer Internet Day saw streams of pictures and positive messages coming in from all parts of Ireland and we were humbled by the amount of preparation undertaken by schools and youth groups. We are immeasurably proud of this year’s Safer Internet Day Ambassadors, who flourished in their roles and have promoted internet safety in their schools and communities. Today also saw the launch of our new educational resource ‘Be in Ctrl’ at Croke Park. Produced in partnership with An Garda Síochána, the ‘Be In Ctrl’ teaching resource has been developed to support teachers as they address the topic of online sexual coercion and extortion – often referred to as ‘webcam blackmail’. Intended for use in the Junior Cycle SPHE curriculum, the resource will help students understand that online sexual coercion and extortion of children is a crime; raise awareness of safe online communication, and know when to seek help and report incidents. ‘Be in Ctrl’ contains three lesson plans, an information pack for school leaders, and will be supported by a Garda Schools’ Talk. The resource will be available for all schools to order, or access online, for free from the 6th February, Safer Internet Day 2018. Download the resource or order your free copy here. To support the launch of Be in Ctrl, Webwise also launched a positive message campaign video. Our Safer Internet Day Trainers, Ambassadors and Youth Panelists worked together to create a video by young people for young people. The video shows young people pledging to be in control of their online lives and encourages other youth people to do the same. It provides helpful tips for other young people to #BeInCtrl.